Rachid Karam, MD, PhD, the Associate Director of Ambry’s Translational Genomics (ATG) Lab, will provide insight into Ambry’s functional studies program in a session entitled “Beyond DNA: How Functional Assays Enable Precision Diagnosis.” The presentation will contain novel data demonstrating how cutting-edge technologies are revolutionizing the interpretation of genomic tests. The ATG Lab was borne out of the need to give clinicians a better understanding of their patient’s test results for future medical management. In this session, he will present clinical cases to exemplify how these studies resulted in improved identification of clinically actionable genetic alterations, enabling precision medicine. Ambry’s ATG lab was launched in 2016 with the goal of reducing the overall number of uncertain and uninformative results on clinical molecular testing through follow-up functional studies. Functional studies performed in the ATG lab include targeted RNA studies for gross duplications and splicing variants of unknown significance, as well as whole transcriptome sequencing (RNA-Seq) for patients with a clear clinical presentation but for whom DNA molecular testing failed to detect an explanatory alteration(s). Rachid obtained his medical degree in Brazil, at the Federal University of Health Sciences of Porto Alegre, one of the most reputable medical schools in the country. 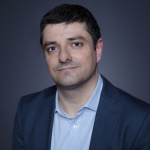 Rachid has a PhD in Oncogenetics, and did his graduate studies on the role of the nonsense-mediated mRNA decay (NMD) pathway in the regulation of the CDH1 gene expression, at University of Porto, in Europe, and at MD Anderson Cancer Center, Houston, Texas. He did his postdoc at University of California, San Diego (UCSD) School of Medicine, where he focused on RNA biology research. Rachid joined Ambry Genetics in 2014, and currently he is the Associate Director of Ambry’s Translational Genomics (ATG) Lab.